There’s a new, Field Tan Yeti Hopper and we’ve got it at J&N Feed and Seed! The YETI Hopper in Field Tan with Blaze Orange liner and zipper, will be available in May. It’s the only soft cooler built for long days in the blind or rough treks off the beaten path. The award-winning YETI Hopper debuted in 2014 and has quickly become the ultimate portable cooler for hunters, anglers, pitmasters, ranchers, and outdoor enthusiasts alike. It boasts the leakproof HydroLok™ zipper, ice-for-days ColdCell™ insulation, puncture-resistant DryHide™ exterior, and tough-as-nails construction. The HydroLok™ Zipper is the ultimate waterproof, airtight closure, borrowing technology from survival suits and HazMat protective gear. ColdCell™ Insulation provides a deep and lasting chill with 1 inch of insulation on the sides and 1.5 inch throughout the Hopper’s base. The heavy-duty EVA foam bottom and RF-welded seams provide waterproof construction and unmatched durability. The Hopper 20, Hopper 30, and Hopper 40 are available in both Field Tan and Fog Gray this spring. The SideKick, the water-resistant gear case for safeguarding valuables from Mother Nature, is available in both colorways as well. 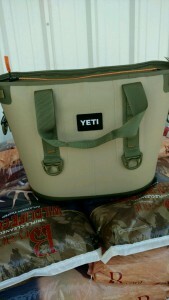 Stop by J&N Feed and Seed for Field Tan Yeti Hoppers, Yeti coolers, Yeti Ramblers, Colsters and wearable items. This entry was posted on Wednesday, June 1st, 2016 at 5:32 pm	and is filed under News & Updates. You can follow any responses to this entry through the RSS 2.0 feed. Both comments and pings are currently closed.